What characteristics does it have? It uses electricity to run so you should not worry about adding fuel and oil. The design is important since you would not want the cable to get into the way while you are doing work. Additionally, the chainsaw should be sufficiently light so that you can operate it comfortably for as long as necessary. You should have a firm and comfortable grip of the tool. When it comes to power, this depends on your individual needs and preferences. Vibration reduction is quite valuable to have as it will inevitably improve your precision and reduce fatigue. This is important for safety too. This model has a unique design which people who are not used to cutting with a chainsaw will appreciate greatly. The cutting mechanism is further away from the handles. More importantly, it is set inside a pair of metal jaws so the risk of you getting into contact with it is minimal. The 4.5-amp motor of the Black & Decker LP1000 Alligator Lopper produces a sufficient amount of power for cutting brunches which get in the way. The 4-inch cut capacity is pretty good for such a compact device. Another impressive thing is the weight of the unit – just over 8 pounds. The cordless models have gained huge popularity in recent years because they are perhaps the easiest to operate – no fuel and no cable to worry about. At the same time, you must ensure that you will have sufficient battery power to do all the tasks at hand. In fact, battery life is one of the major factors which you should consider when buying such a unit. Quick charging is also a huge plus. If you want to be on the safe side, you may consider keeping a fully charged spare battery at hand all the time. The DigiPro motor technology allows the electric tool to make better use of the battery. In fact, you can make 100 cuts on a single charge which is quite good, especially in the case of home applications. The technology offers other advantages too. It boosts the torque for more powerful cutting while reducing vibration. This is how you will enjoy much more powerful operation. 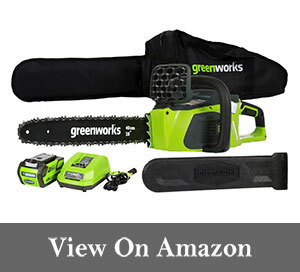 This GreenWorks cordless chainsaw comes with one 4AH battery and charger. The safety features include reliable chain break and low kickback chain design. You should expect to get smooth and reliable performance from a chainsaw which offers the best value for money even though it may not come with a variety of bells and whistles. It must have the main safety features which are considered standard at present. It should have good design which makes it easy to hold and to operate. You should not get exhausted after a few minutes of holding the chainsaw. 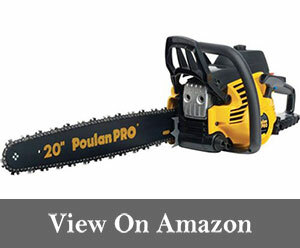 Consider our proposition to decide if it could be the best chainsaw for you. This cordless model is very light and has great design. As a result, you will find that operating it is a breeze even when you have to complete more challenging tasks. The wrap-around bale handle contributes a lot to this. You will always have a firm grip of this Black and Decker chainsaw. The 20V MAX lithium ion battery provides for a longer runtime. It’s interesting to note that this model can last 5 times longer when the battery is fully charged compared do its predecessors. Another truly outstanding feature is the 10-inch bar with low kickback chain. It makes the tool quite versatile. If you plan to use your new tool professionally, you would want it to be made to last. From the engine to the crankshaft, each component must be designed so that the rate of natural waring and weakening is reduced to the very possible minimum. While you cannot expect the best chainsaw for professional use to be lightweight, it should have a design which allows for firm and comfortable holding, precision operation and fatigue minimization. You will benefit from focusing your attention on models from leading brands that have long-term traditions in the manufacturing of chainsaws. With its powerful motor and extra-long bar, this chainsaw can handle even the toughest applications. 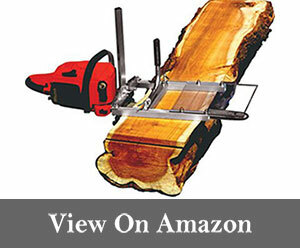 You can use it reliably when it comes to tree cutting. The tool is very-well designed, but you have to keep in mind that it is quite big so advanced cutting skills are recommended for handling it. The smart start and the air injection make the operation of this Husqvarna chainsaw quite smooth and hassle-free. The chain tensioner is mounted on the side for maximum convenience when making adjustments. The forged three-piece crankshaft is a component which gives the tool great durability. It is now easier than ever before to find a chainsaw which will help you to complete a variety of cutting and pruning tasks in your garden. The tool should be light and well-balanced. It should have good ergonomics too. This is important for achieving accuracy and staying safe even if you are not particularly skilled. You should consider an electric model as it doesn’t require special preparation for use and extensive maintenance. It should be a powerful performer at the same time. Versatility is also important given that there are various tasks to be done around the garden. Don’t be fooled by the compact size. 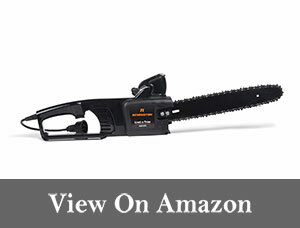 This chainsaw is quite powerful with its 14.5-amp motor. It delivers exceptional cutting performance. The 16-inch bar makes the model highly versatile and this is a great place. The auto-tension feature keeps the tension optimal at all times without you having to tweak it manually. 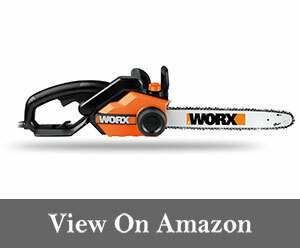 You will get the main safety features with this WORX chainsaw including a low kickback bar and a chain brake. The model has automatic oil lubrication which reduces the maintenance effort required even further. If you are looking for tool which can handle this specific application, the main factor which you need to look for is power. The more powerful the motor is, the better. The model should also have sturdy construction. It must be built to last given the challenging tasks which you will perform with it. One factor which many buyers tend to underestimate is ergonomics. It’s actually essential because you won’t be able to do a good job if you can’t hold the tool comfortably. The first thing which you notice about this chainsaw is its ergonomic design. It’s extremely easy to hold. You will have tight and comfortable grip of the handle for increasing your accuracy and reducing fatigue. The LowVib technology, which reduced vibration helps immensely for this too. The 3.2 HP X-Torq motor is extremely powerful so you can cut hardwood without way too much effort. The motor is fuel-efficient and produces lower exhaust emissions. 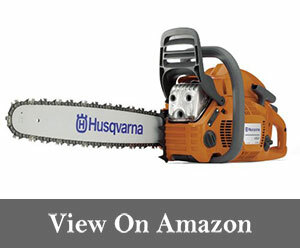 The 18-inch bar makes the Husqvarna 450 chainsaw quite versatile. It is considered to be excellent for home use. With the Smart Start feature, you can always start the tool effortlessly. The purpose of the mill is to facilitate the milling of large logs into lumber. It enables you to do the job more quickly and effectively so you should definitely get one. The choice is quite large at present so making a decision may prove to be somewhat challenging. Still, you have to ensure that that the model which you pick will meet an important set of requirements. It must be lightweight and tough at the same time. It should be easy to adjust and to remove once you are done with the job. Here is our top pick. This chainsaw mill is built to last. It has strong construction while being perfectly lightweight. You can easily attach it to the saw without drilling bar. This makes it extremely convenient to use. You should not expect to spend a lot of time setting up the mill. Perhaps the best thing about it is that it gives you a multitude of lumber thickness options when it comes to cutting. These range from 0.5 inches to 13 inches and even 17 inches. A key thing to keep in mind about this Granberg model is that it works with bars which are 20 inches longer at the most. 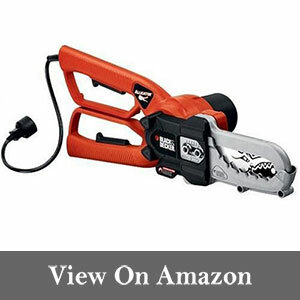 You’ve already mastered the use of this important tool and now you want to get the best chainsaw for creating beautiful sculptures of whole pieces of wood. Finding it should not be that big of a challenge given that more and more manufacturers now cater to the needs of this market segment. Perhaps the most important thing in the case of carving applications is the design of the chainsaw. You should be able to handle it with easy and turn it masterfully to create amazing sculptures. Additionally, you may want to avoid electric models with a card as it may get in the way. This model looks rugged and it actually is. At the same time, it has excellent ergonomics which makes wood carving an even more pleasant task. The wrap-around handle enables you to point the bar in any direction that you like with ease for the highest level of precision. The design allows for great vibration reduction too. The 2.4HP EcoBoost engine is sufficiently powerful for most cutting jobs and not only for carving. As its name suggests, it is designed to have lower fuel consumption and reduced exhaust emissions. The 22-inch bar is sufficiently long for all jobs. The anti-kickback chain provides a high level of safety. You don’t have to spend a small fortune to get a high-quality chainsaw which performs excellently and boasts with great durability. The reality is that there are a lot of models which can meet all of your major requirements for less than $200. You can easily get a powerful unit with a sufficiently long bar for performing all kinds of tasks around the garden and not only. You can also expect to get some pretty fancy features and even cool accessories. What more can you possibly want? Check out our winner in this category. You will discover that this model is quite light and compact so you can expect to do all sorts of jobs with ease even if you are not in perfect shape. The design boasts with fantastic ergonomics too. The handle is large and you will not feel all the vibration while you hold it. Don’t expect to get tired easily. The DuraLife engine is made to have a long useful life, as its name implies, and you can expect it to be quite durable indeed. The pull starting system really helps to make your life easier. It works reliably regardless of the weather. The automatic oiler is a true blessing and so is the carrying case. When you want a great tool for home use, but you have a very tight budget, you should not despair. You simply need to be more careful when it comes to choosing a chainsaw. You can easily find a model which costs very little money and still performs exceptionally well while being reliable and durable. Of course, you may not get a bunch of fancy features, but this is not the end of the world as you can always upgrade later on. The tool is slim and light so you can use it with ease even if you are not strong or experienced. It’s perfect for trimming shrubs and trees around the yard without much effort. The 8-amp motor is quite powerful and you should not expect it to fail you. The low-kickback bar measures 14 inches which is perfectly sufficient for most home applications. You will find the external chain tension adjuster to be quite useful. The push-button oiler makes maintenance a lot easier. This brand has been a leader in the chainsaw industry for quite some time. It has become synonymous to quality and this is the main reason why buyers often focus solely on its models. There is a huge variety so you have to outline your individual needs and requirements to make the best choice. 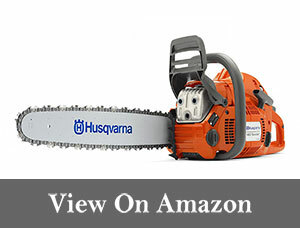 In general, you can expect every Husqvarna chainsaw to be powerful, completely dependable and very durable. You can readily add ease of use to this list too. You will be happy to learn that this model has a very powerful engine making 3.62 horsepower. This makes it capable of handling even the toughest jobs. The 24-inch bar enables you cut some pretty big branches and even whole trees and logs. 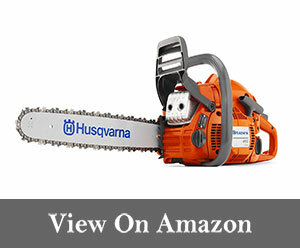 This Husqvarna chainsaw has a clever design which results in outstanding ergonomics. You will have perfect control of the tool. The LowVib technology reduces vibration for even greater comfort and fatigue reduction. The Smart Start feature makes starting the engine super easy regardless of the weather. 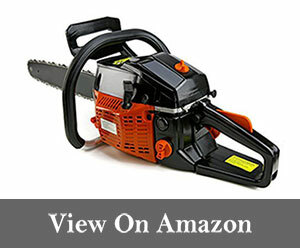 There are different types of chainsaws designed based on the user needs. This tool is used for different types of jobs including tree felling, bucking and pruning. The commercial-grade models are designed to be used by experts and even those for home use require some level of skill. You can use a chainsaw to fell trees and to remove branches and foliage. In addition to this, this tool is also used by professionals to fell snags and to help in cutting firebreaks in case of wild fire. It is essential for the efficient harvesting of firewood. Some chainsaw specialists even use this tool for cutting concrete. In some parts of the world like Finland, it is used for cutting ice. Engine or motor – The engine in almost all chainsaws has two-stroke design and runs on gasoline. There are models which use an electric motor for cleaner operation. Drive mechanism – This is another important part of the chainsaw. It is typically a centrifugal clutch. Cutting chain – The cutting chain is the part which gets into direct contact with the object to be cut. Each segment of this chain has sharp cutting teeth. Each tooth is made of chromium plated steel. The left handed and right handed teeth are alternated in the chain. These are the essential parts of the chainsaw. But you should know that in recent years, significant improvements have been made in order to make this tool more secure. The inventions provide much more reliable protection from serious accidents and injuries. This is important for users of all skill levels. Some of the major improvements in this type of tool include the chainbrake systems, the better chain design and the anti-vibration systems. Manufacturers are also catering to the needs of users who practice chainsaw carving by making short, narrow tipped bars for the purpose. These can add incredible versatility to a model. The use of a chainsaw requires paying attention as even the slightest negligence may lead to serious injuries. There are different user guides which can help you do a good job and stay safe at the same time. One of the key things is to be aware of the possible dangers associated with using a chainsaw. Injuries may occur due to the different factors including the large amount of forceapplied during operation, the fast movement of the chain and the vibration of the tool. In some cases, the injuries may also arise due to poor maintenance of the machine or while attempting to cut inappropriate material. There are many different research studies which have clearly shown that the use of hand held tools including chainsaws may cause vibration white finger, tinnitus and industrial deafness. In short, we can say that there are different types of risks which are associated with the use of this tool. Therefore, in order to avoid the above-mentioned injuries and risks, protective clothing and accessories must be worn while using a chainsaw. The gear may include boots, trousers, goggles and hearing protectors. In some parts of the world, license and special training are required in order to operate a chainsaw. Another important risk which is associated while using this machine is that the operator of this chainsaw may be exposed to harmful and dangerous carbon monoxide gas. For protection from gas, the operator should wear a chainsaw mask. A chainsaw is basically a portable tool which is used for different purposes. This chainsaw can be powered in different ways fuel and electricity. It may have a hydraulic system for smooth operation. There are various companies manufacturing different chainsaw models for personal and commercial use. There are considerable differences when it comes to working capabilities, engine/motor capacity, design and features. Chainsaws are manufactured in different parts of the world and this is something which buyers should be well aware of as it may create variations in the quality of these tools. The use of chainsaws has increased considerably over the few years. One of the main reasons for this is that they are becoming lighter and easier to use for the average consumer. When you buy such a tool, you will be able to do even more complex tasks in the garden instead of calling a professional. When it comes to cutting hard tree limbs for cleaning or for getting firewood then using a chainsaw is the only solution. This type of tool is designed to perform hard tasks easily and smoothly. You should not expect a modern chainsaw to be loud and oily and to have some sort of smell. It should be easy to keep and to use even if you are not much into machines. You can expect it todo heavy duty work quickly without much effort on your part. 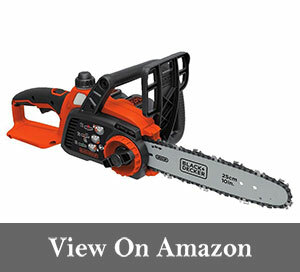 At present, there is an extremely large selection of chainsaws for the residential buyer to select from. You will benefit from deciding on the most suitable type for you in the first place. The gasoline-operated models are powerful and enable you to perform heavy duty tasks with ease. With an electric chainsaw, on the other hand, there is no need to add fuel and oil and the maintenance is very basic. You can consider a cordless model, especially if you don’t have to perform many tasks for a long time.